Inspired by conversations on the FOOD52 Hotline, we're sharing tips and tricks that make navigating all of our kitchens easier and more fun. Today, Merrill shares her favorite way to peel an apple. Apple peeling isn't the most difficult kitchen task, we know, but why not make it faster and easier if we can? Today, Merrill is sharing her favorite way to peel an apple. Now you can peel mountains of them (and put them to good use) in no time. Do you have any tricks for peeling apples? Share them with us in the comments! This video was shot by Alex Lisowski and edited by Kyle Orosz. I tried this the other day when made a pie and it was so fast! Much faster than "how Julia taught us" and I didn't mind having those little end pieces to snack on one bit. It makes us happy too! A friend of ours wrote it for us. The best way to peel an apple for me is to use a sharp paring knife and my thumb as a pivot. With a little bit of practice you can do it in no time at all. The back and forth of this technique is not something I would relish. Quartering the apple first often speeds the process as well. For those who like to peel around the apple, you can still do this with this method, and you save the trouble of having to cut out the ends (plus you get a snack!). Also, peeling away from you, as Merrill does, is safer and easier for those who are new to peeling. But if you like to peel toward yourself, go for it! Seriously? No - that's the most awkward and inefficient way I've ever seen anyone peel an apple. I mean, I realize everyone has their own way that they like, but I don't think many people would agree that this was "the best" way. Like others have mentioned, I peel around the apple, starting on one end and ending at the other - very fast, very little waste. I just had my daughter time me - 25 seconds and I even dropped the apple once while peeling it. If I have a ton of apples to peel, I use a rotary apple peeler. It's a matter of how you're used to peeling apples, and who's to say which method is best. Prep is essential, and is a Zen experience of high order. I use a variety of around 8 apples, some firm and some smushy, so there are no hollows under the top crust after baking. From shopping for the apples till the pie dish is washed, it's a win-win for the cook and eaters all around. But how will you be able to make one long peel to drop on the floor to reveal the initial of your one true love? Love this video, and I firmly believe the cook should always get a built-in snack. Since most of the time I'm going to slice apples if I'm peeling them, I do what Julia taught us: quarter the apple, use paring knife to remove the inner seeds core, and then peel each quarter with at most three strokes. nonesense! peel your apple in an upward motion, with your thumb holding the bottom. And why bother with cutting off the ends? best way - peel around the apple; goes fast and nothing is wasted. Then, for pies, cut the apple in quarters, cut out the seed house and then cut the quarters into smaller slices. time-honored method. New one is clumsy. I core the apple, stick my thumb in it, then use that and a finger to hold it while I either peel up and down like Merrill does, or horizontally. Either way it's pretty fast! I don't think this method is faster, either. You have to switch from chef's knife to peeler, and you waste a lot of fruit cutting off the top and bottom. 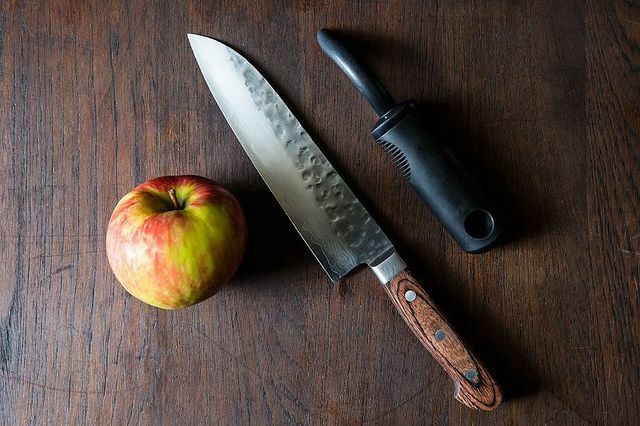 I prefer to hold the peeler or paring knife more or less steady with one hand and turn the apple against it with the other--basically, mimicking the motion of one of those old-school hand-cranked peelers. It goes fast and wastes little fruit once you get the hang of it. You don't waste it -- you get to eat it! But you lose all the fun of trying to get the peel off in one piece! I'll let you know how it works out! I have it and it works extremely well. Just be careful when attaching the handle that you don't over tighten it. My son over tightened mine and it caused the plastic housing to form a slight stress crack. Doesn't affect the functionality of the device, but the crack bugs me. I cut the apple in half, scoop out the seed pocket with a melon baller, cut into wedges, then use a bird's beak parer to remove the skin of each.